If you are an SEO, chances are good that you have needed to use Chilling Effects while doing SEO or competitive analysis. Chilling Effects has undergone some brand new changes, some will make it even easier for doing research on notices in their database. One of the reasons for the change is the mere size of their database. Links to old notices that were originally located on a Chilling Effects will continue to redirect and work as intended. If you check for search results removed from the Google search index, they still refer to ChillingEffects.org and not LumenDatabase.org. They do forward to the correct Lumen Database URL as intended when you click on them. Bing does not include links to Chilling Effects or individual results, but instead links to a support page detailing why they remove some results. One interesting note they have made is just how many DMCAs, and associated URLs, have been sent to date, and it is growing at a rapid rate. Chilling Effects received its one-millionth notice on June 1, 2013, its two-millionth only a little over a year later, on August 22, 2014, and its three-millionth on July 12, 2015. We should reach three-and-a-half million before December 2015. Additionally, individual notices sometimes (and, it seems, increasingly) identify multiple URLs as sources of allegedly infringing content. Chilling Effects received its one-millionth URL in January 2012; its five-millionth in August 2012; its fifty-millionth in April 2013; its five-hundred-millionth in September 2014, and its one billionth in October 2015. 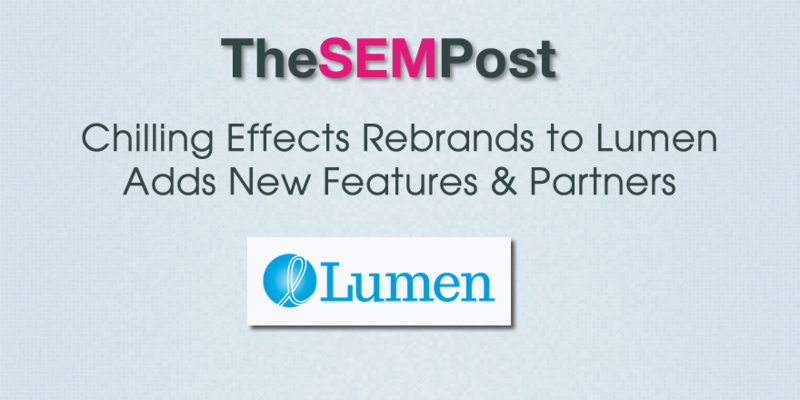 Lumen is also preventing search engines from indexing their site under the new URL. At the beginning of the year, they made the decision to prevent the notices from being indexed, in part because of complaints from the copyright holders. They also announced a new partnership with three research centers. The NEXA Center for Internet & Society in Turin, Italy; The Instituto de Tecnologia & Sociedade in Rio de Janeiro, Brazil; and The Center for Communication Governance in Delhi, India.